Ascension With Earth blog is continuously monitoring many different news feeds that relate to Antarctica. "Insiders" like Corey Goode, David Wilcock, Kent Dunn, and many others over the years have presented information that shows that secret military bases, Nazi outposts, Reptilian extraterrestrial bases, and ancient civilizations do exist in the icy continent of Antarctica. They have also been promoting that public disclosure will be coming soon in regards to a major discovery of an ancient civilization. Today two different news stories and soft disclosures emerged suggesting to the public that more awareness should be given to Antarctica. The following news stories are suggesting that a man made structure is now seen protruding from the ice showing an unnatural dome like structure. The other news story is about a massive iceberg which is about to break off from mainland Antarctica, suggesting a possibility that a major reveal could take place and show what is under the ice sheet. Continue below for a compilation of news articles from around the world talking about Antarctica today on January 6, 2017. An image of a 'dome' in Antarctica has sparked claims there was once a civilisation living in the frozen continent. The picture, which is said to be from Google Earth, shows an oval-shaped structure that is believed be 400 foot (121 metres) across. Some have claimed the structure is 'evidence' that a human civilisation once lived in the South Pole, while others say it may be a natural phenomenon. What apperars to be the remains oval shaped “building” is 400ft across and appears to have all the hallmarks of being a sizeable, man-made construction - similar to a mediaeval motte and bailey castle. If true, it would reshape everything scientists thought they knew about humanity’s past as it would prove people inhabited what was previously thought to be a desolate region. 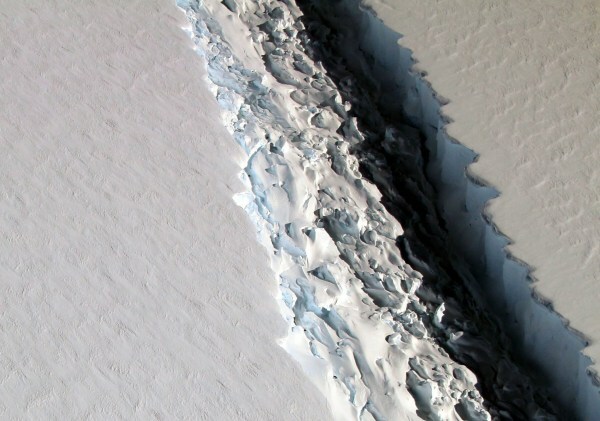 An iceberg the size of Delaware is poised to break away from Antarctica, an event which may lead to the collapse of a massive ice shelf on the continent, according to researchers. Scientists say that a 1,900 square-mile section of the "Larsen C" ice shelf is now only connected to the main body by a 12-mile section of ice. Researchers monitoring a huge crack in the ice discovered that it had grown rapidly during the second half of 2016 — increasing in size by 11 miles in December alone.